New Long-Term Contract Rules. The Handbook explains the liberalized rules that exempt more contractors from using the percentage of completion method. QBI Deduction. Many types of taxpayers are impacted by the Section 199A deduction for Qualified Business Income—including farmers, professionals, real estate owners and more. The Handbook explains how to maximize the deduction for taxpayers who rely on you. Farmers, Gamblers, Disaster Victims, Divorced Taxpayers and Disabled Individuals. For these and many other specific types of taxpayers, the Handbook explains the impact of the many new TCJA provisions—including changes that restrict traditional tax benefits and must be complied with, and others that present new opportunities to save tax dollars. In addition to the general tax rules that apply to all individuals, some individuals are subject to special tax rules that apply to them because of their occupation, investments, or life events. As a tax preparer, you’ll likely encounter these types of clients so it’s important to have a tax resource specifically designed to answer the questions you’ll face when preparing their returns. 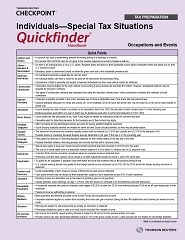 The Individuals - Special Tax Situations Quickfinder Handbook will save you time and money on those out of the ordinary tax returns or tax situations you’ll encounter when preparing individual returns. It covers more than 30 types of unique taxpayers. By honing in on the specific tax rules that apply to specific taxpayers, the Individuals - Special Tax Situations Quickfinder Handbook is the perfect complement to the 1040 Quickfinder Handbook. See information above for new edition availability. To order the current or prior tax year editions, please call us at 800-510-8997 800-510-8997 FREE. Is the Student a Dependent?